In this tutorial we are going to learn about adding digits present in a given number.The main concept of this problem is…..If the input is 225 then the output should be 9 i.e is addition 2+2+5.The logic behind it is we need to get the single digits of the number..i.e is 5,2,2 separately. This entry was posted in C and tagged c program to add digits of a number, c program to calculate sum of digits of a given number, c program to find sum of digits of a number, c program to print sum of digits of a number, program to find sum of digits of a number in c, sum of digits of a number in c using while loop, write a c program to find sum of digits of a number. Bookmark the permalink. 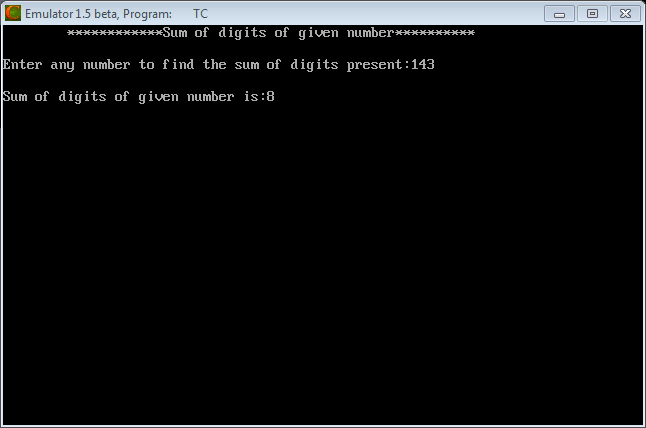 Pingback: Palindrome Number Program in C | letusprogram...!! !